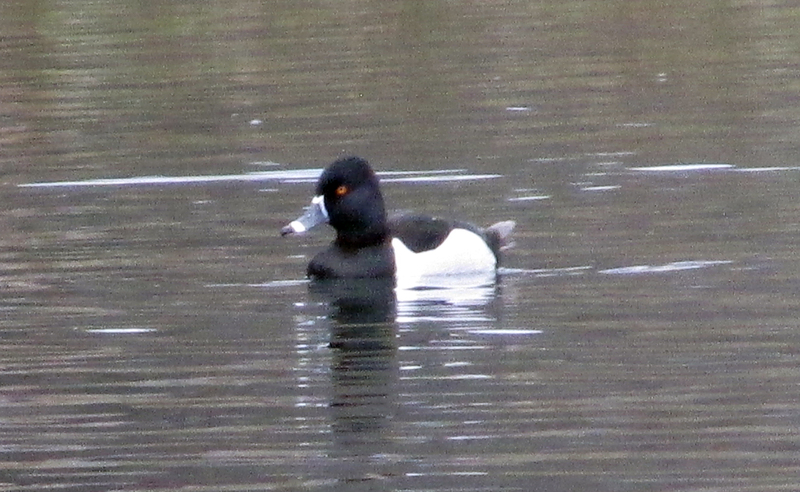 Photo by Bryan Stevens A Ring-necked Duck visits a pond at Erwin Fishery Park. The recent extremely warm weather — well, warm for the month of March — may have finally broken the back of winter. Signs of spring are becoming easier to detect, especially among our feathered friends. The pond at Erwin Fishery Park had been a great location to view migrating waterfowl for the past few weeks, but most of the visiting ducks — redheads, ring-necked ducks and American wigeon — appear to have concluded their late-winter visit. 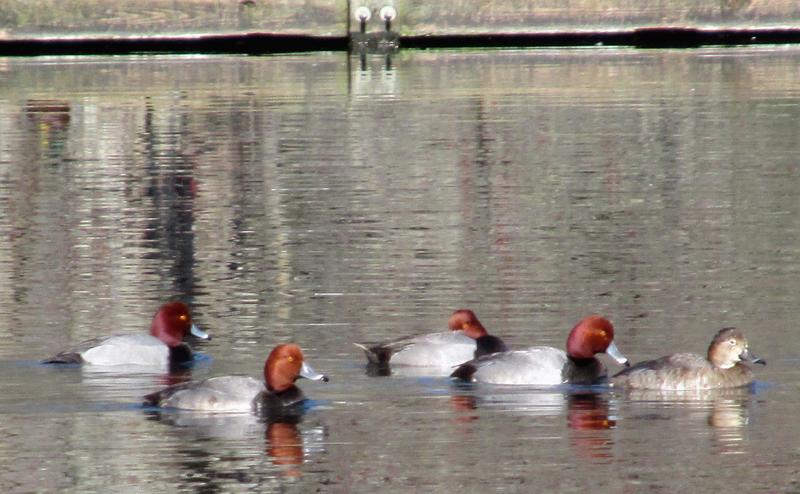 Photo by Bryan Stevens A raft of Redheads floats on the surface of the pond at Erwin Fishery Park in Unicoi County, Tennessee. Signs of spring are becoming easier to detect, especially among our feathered friends. 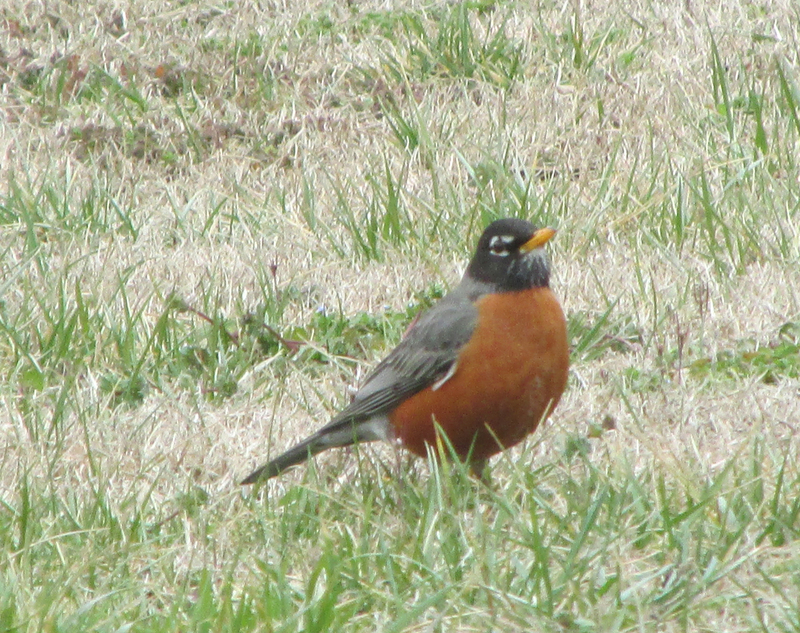 I’ve heard from numerous readers about flocks of American robins making welcome visits. While not the only harbinger of spring among our birds, robins are probably foremost among the birds we like to associate with the arrival of spring weather. The numerous large flocks of robins I observed during the last couple of weeks of February and early March, however, consisted mostly of birds coping with heavy snowfalls. Photo by Bryan Stevens American robins are a familiar sight on lawns in spring. While the robin is widely believed to be a harbinger of spring, many other birds can also lay claim to this distinction. The month of March is usually a time of transition, with many winter birds making ready to depart as some of our summer favorites return from their more southern wintering grounds. At home, I have noted the spring arrivals of Eastern phoebes and belted kingfishers. On March 6, a wary pair of wood ducks made a brief visit to the fish pond on my property. A couple of other bird species will probably make their appearance at some point in March. At my home, brown thrashers, tree swallows and red-winged blackbirds have returned and are already making themselves comfortable. These species and a handful of others are usually in the vanguard of spring arrivals. Let me know what you’re seeing as spring advances. I always enjoy hearing from readers. Among the readers who have written to me recently was Shelly Jones, a resident of north Abingdon, Virginia. 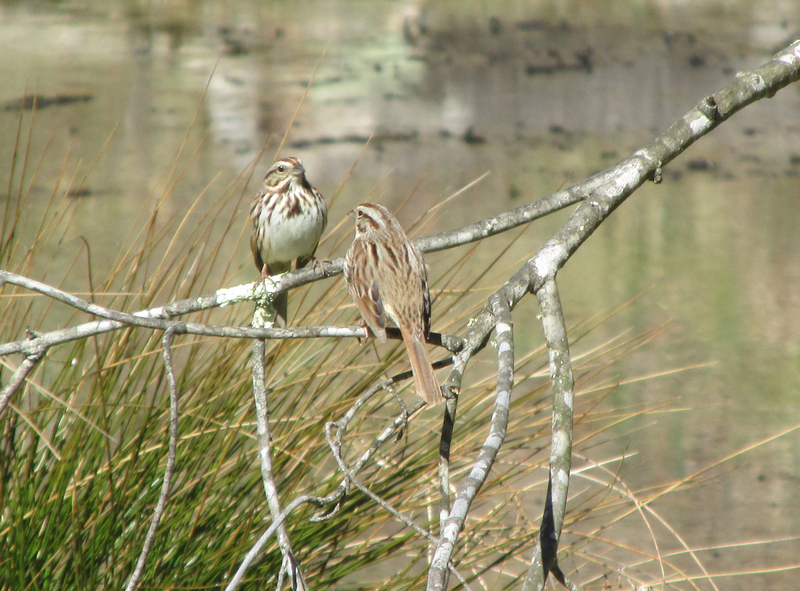 Photo by Bryan Stevens Song Sparrows are already making efforts to attract mates for the first spring nesting attempts. Shelly commiserated with my never having been fortunate enough to get a visit from a red-headed woodpeckers at my home. She added that not only has she never been visited by a red-headed woodpecker at home, she has never seen one of these woodpeckers at all. “I have seen the great pileated woodpecker flying through the tree tops,” she noted. 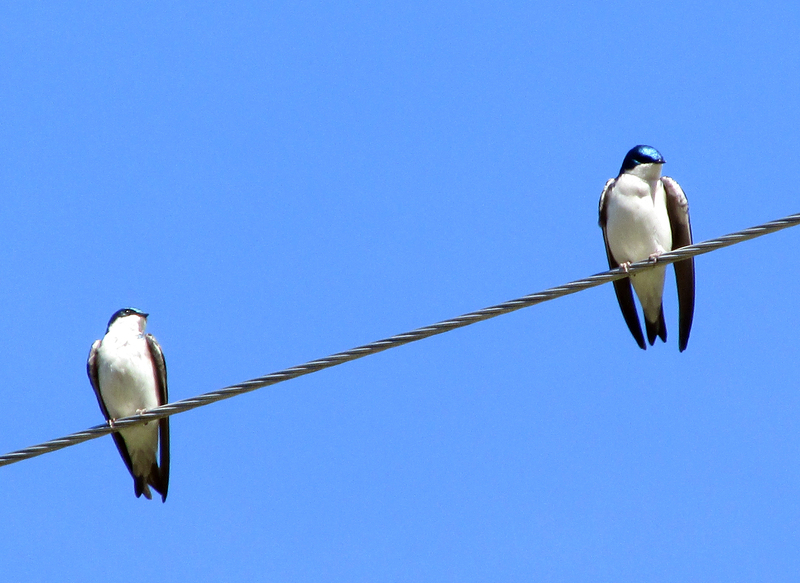 Photo by Bryan Stevens Tree Swallows perch on a wire over a pond in Hampton, Tennessee. Her luck changed shortly after I ran the last installment on a series focused on the members of the woodpecker family. Shelly and her husband live on five acres, mostly pasture for their two horses, but they are surrounded by woods on three sides, with many oak trees thriving in the woods. The habitat she described sounded imminently suitable for attracting red-headed woodpeckers. I wrote an email back to Shelly congratulating her on the home visit from this woodpecker and joked that I was a little envious of her good fortune. Photo Courtesy of Gayle Riddervold This photo of an adult Bald Eagle was taken this past winter along Simerly Creek Road. Gayle Riddervold and Rebecca Kinder recently shared a photo of an adult Bald Eagle that they had taken along Simerly Creek Road in Hampton. They had been leaving for a trip to Gatlinburg, Tennessee, when they saw the eagle and stopped to get a photo. 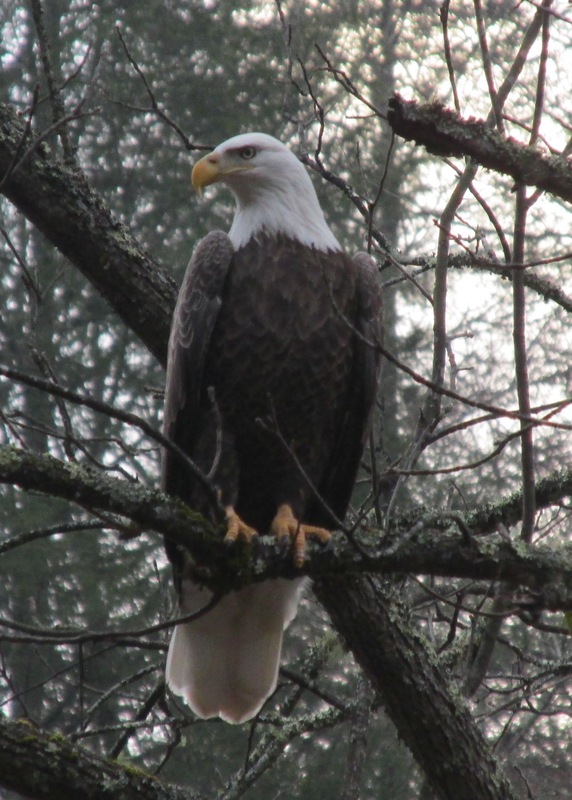 Bald Eagles are often seen along lakes and rivers in Carter County during the winter, but finding an eagle at higher elevations is somewhat unusual. Other readers have been sharing bird sightings that, if we’re fortunate, offer a signal of the changing seasons as winter wanes and spring nears. Adelaide Moss in Abingdon, Virginia, wrote with a question about vultures. Vultures, by the way, are considered a harbinger of spring in some sections of the country. 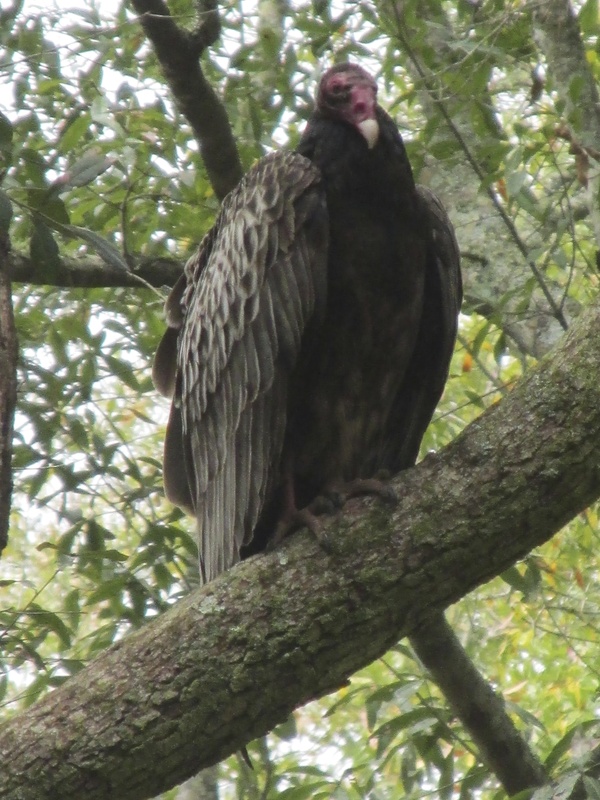 The two species — turkey vulture and black vulture — are year-round residents in our region. “I am very curious about the vultures that hang out in trees in winter,” Adelaide wrote. “What on earth do they all eat? There are so many of them I can’t imagine there is enough roadkill to feed them all. She added that she never sees vultures eating except occasionally on roads where they are eating roadkill. “I would love to know more about them,” she wrote. Photo by Bryan Stevens Turkey Vultures, unlike most birds, have a well-developed sense of smell. I’ll focus on the turkey vulture, which benefits from a sense of smell that is absent in most other birds, the related black vulture included. With its finely-tuned olfactory senses, the turkey vulture can detect roadkill and other carrion from a distance of a mile. These birds can also use their large wings to soar for hours. Soaring is much more energy-efficient than the flapping of wings. Experts who have studied turkey vultures estimate the birds may travel 200 miles or more in a single day in foraging for a meal such as a deer’s carcass or even an opossum squashed on the side of the road. Like many a scavenger, the turkey vulture’s not finicky and will eat almost anything. Pairing excellent eyesight with a good sense of smell means very little edible roadkill goes unnoticed by these birds. I recently received an email from Tom and Helen Stetler in Elizabethton, Tennessee. 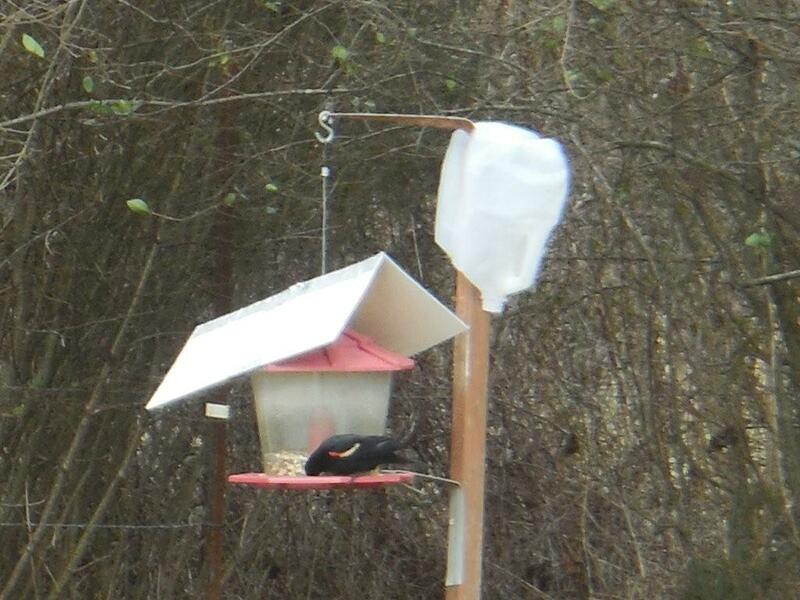 They reported seeing several “early birds” in their yard recently, including a total of six Red-winged Blackbirds. “One even went up on the bird feeder,” they wrote. Photo courtesy of Tom and Helen Stetler Red-winged Blackbirds, such as this bird, began returning to the region in February. The couple noted that Red-winged Blackbirds are usually harbingers of spring, but they arrived with some of the last of the winter weather in February. “Oh well, better days are coming, Lord willing,” the Stetlers wrote. They also added they have seen Song Sparrows and an Eastern Towhee at their feeder in recent days. To learn more about birds and other topics from the natural world, friend Stevens on Facebook at https://www.facebook.com/ahoodedwarbler. He is always posting about local birds, wildlife, flowers, insects and much more. If you have a question, wish to make a comment or share a sighting, email ahoodedwarbler@aol.com. This entry was posted in Birding, Birds, Spring birds, Spring harbingers, Tree Swallow, vultures and tagged Birding, birds, Bristol Herald Courier, Bryan Stevens, Carter County Compass, Elizabethton Star, Erwin Record, Feathered Friends, Friends of Roan Mountain, McDowell News, Our Fine Feathered Friends, Songbirds, Spring Bird Count, Spring migration, The Erwin Record, Tree Swallow on March 20, 2016 by Bryan Stevens. Very nice spring post! Gayle is a friend from church. She got a good pic of the Eagle! Harry saw a pair of Hooded Mergansers today between DOT and Color Works.